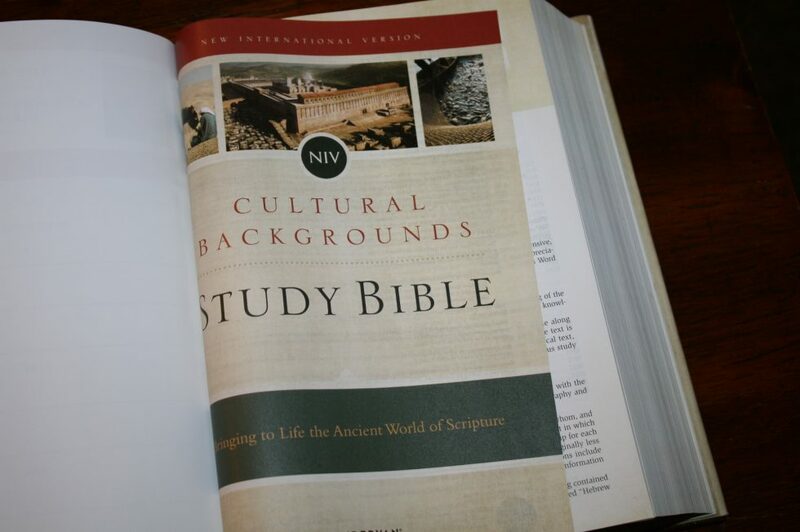 The NIV Cultural Backgrounds Study Bible is Zondervan’s replacement of one of my all-time favorite study Bibles – the Archaeological Study Bible. 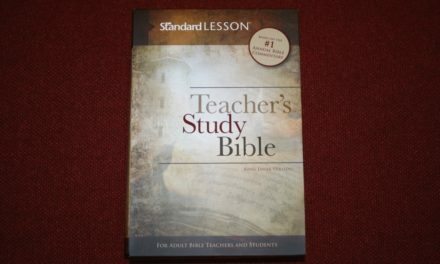 This one is much smaller, making it a standard size study Bible. It’s available in several covers. I’m reviewing the hard cover edition. This edition is hard cover with a dust jacket with marketing info. The hard cover itself is a textured red with gold lettering. It has a sewn binding. It seems to be constructed well. The overall size is 9.5 x 6.5 x 2.25. 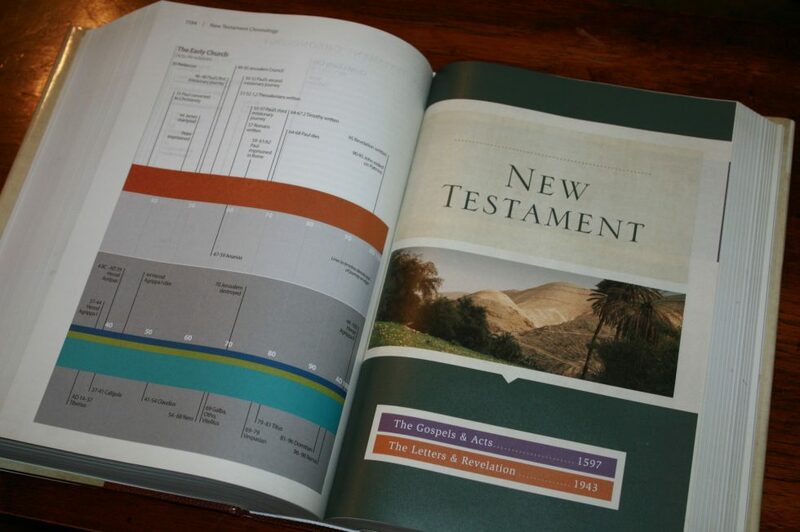 The paper is around 30gsm and is the typical paper found in today’s full-color study Bibles. It has a tan-ish parchment look in the inner margin and in the header and footer. It’s decently opaque – especially considering how bold the text and images are. I had no issues with reading it or turning the pages. This is a double-column paragraph format with center-column references and notes in the bottom portion on the page. 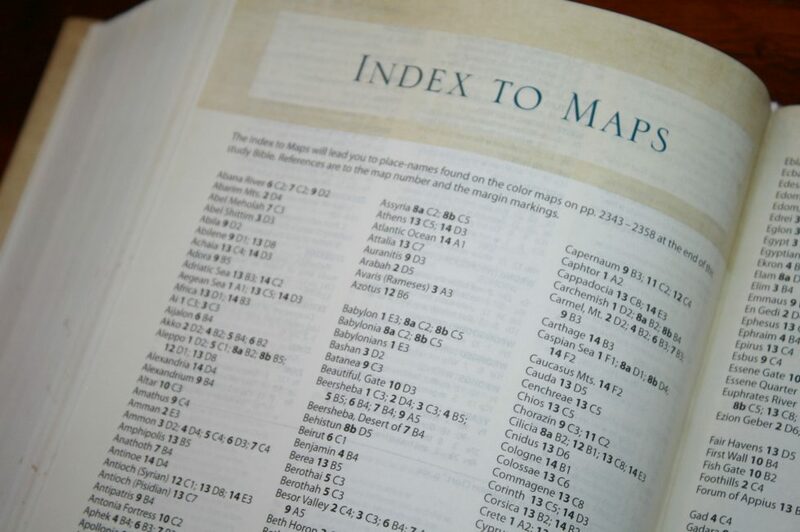 Maps, charts, photos, and articles are placed within the notes and the text throughout the Bible. 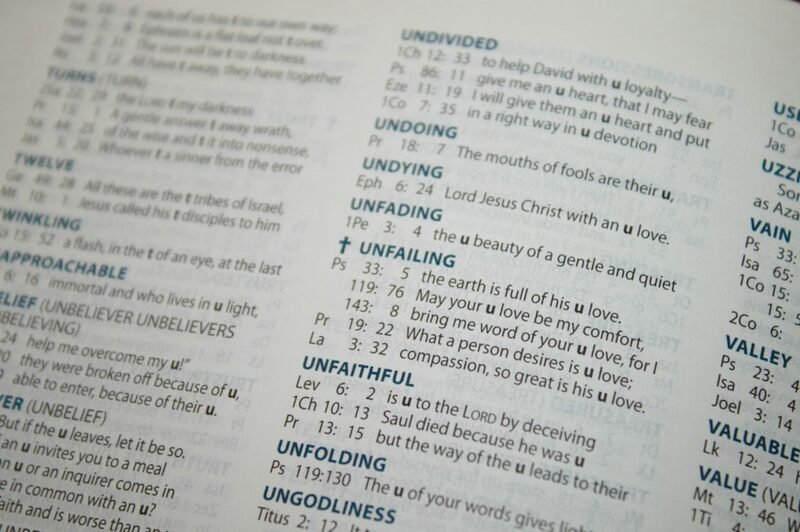 The header shows the page number, book name, chapter, and verse numbers in the outer corners. The text has an 8.5 point font and is highly readable. It’s about a medium darkness. The red-letter also has a medium shade. Both are highly consistent throughout the text. The notes are a much smaller (7.5) and lighter font, making them more difficult to read. The columns are 2.25” wide and have 42-44 characters across, with around 8 words per line. The spacing never feels too cramped and it doesn’t have any awkward spaces between the words. 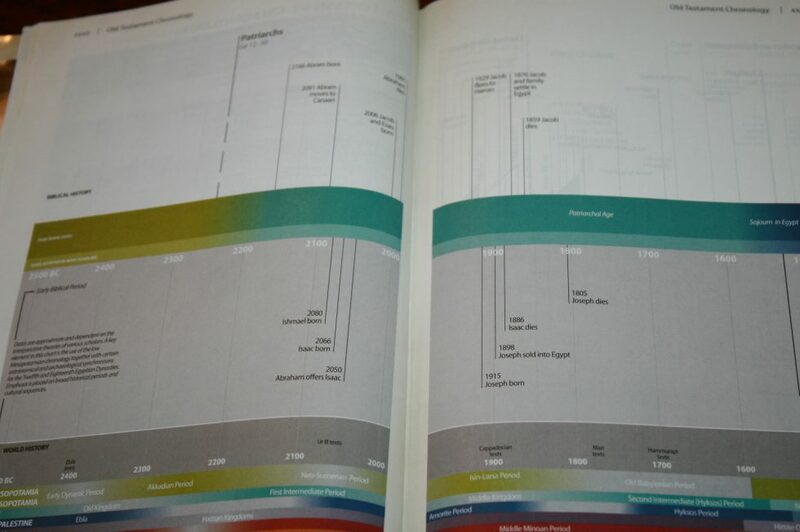 All of the highlights within a section are color-coded for that section. 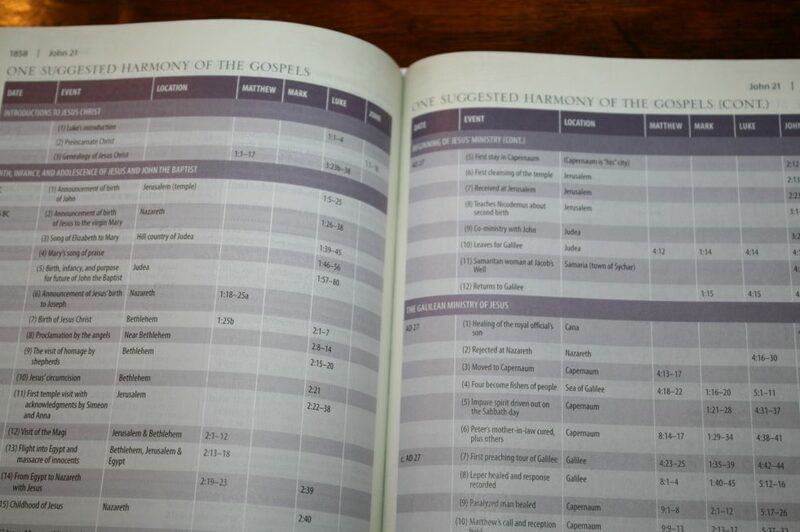 This includes section headings, chapter numbers, chart titles, article titles, set. 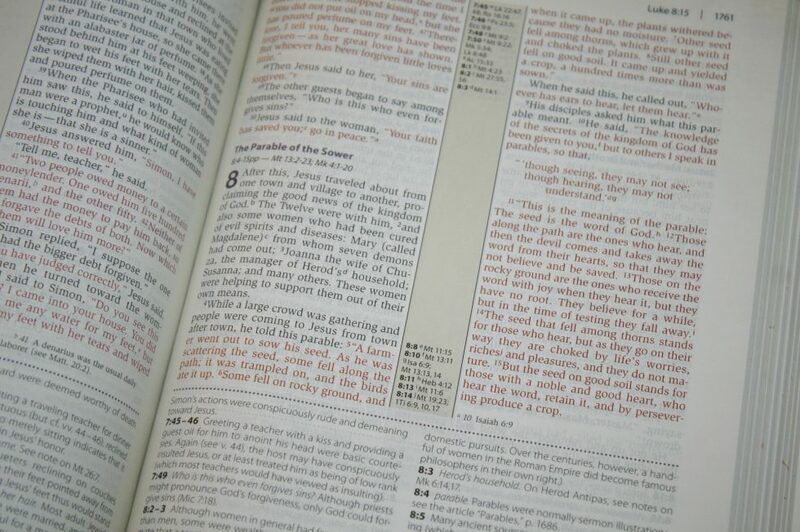 You can tell just by the highlights what portion of Scripture you’re looking at. The verse numbers are small and blend in. For me this makes them difficult to find. References and footnotes are both keyed with letter. References are regular letters while footnotes are italic. 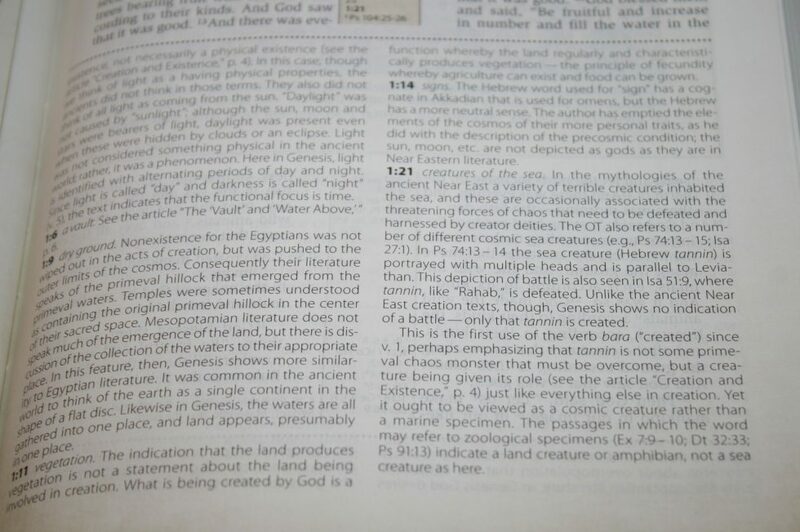 This keeps me from looking for a footnote when I mistake the verse number as a footnote key. They don’t stand out that bad and I didn’t have issues reading the text. 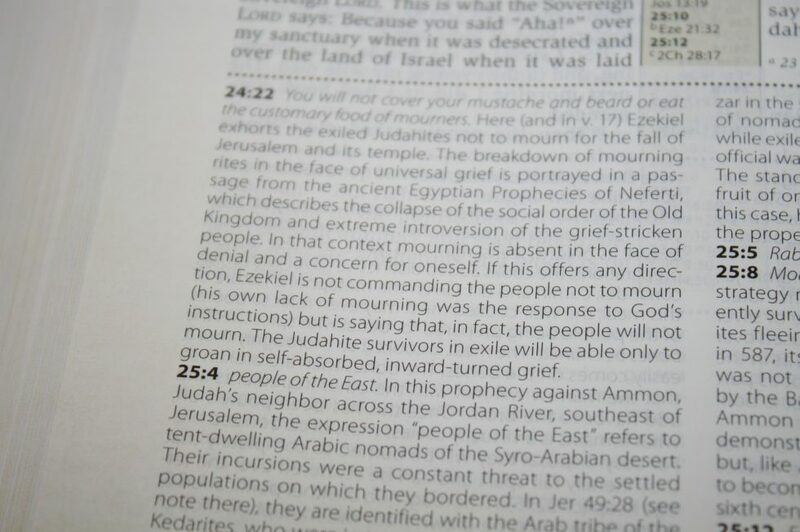 The regular NIV references are included. 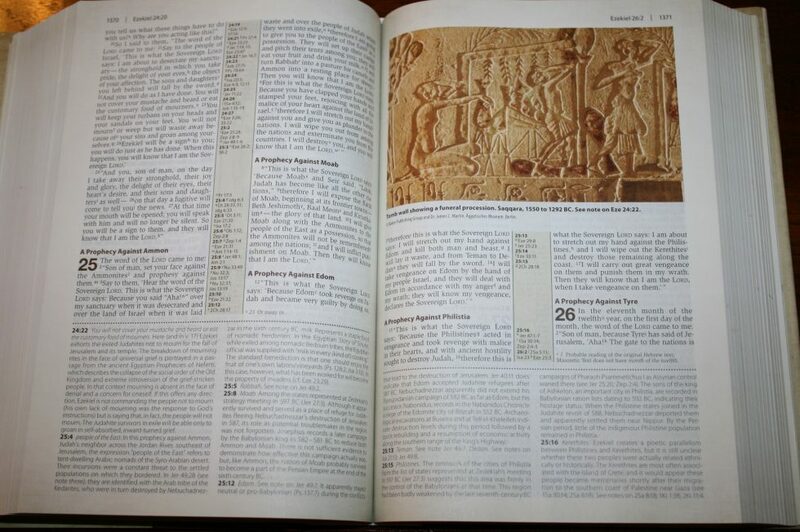 They’re placed in the center column and are keyed to the text with letters. 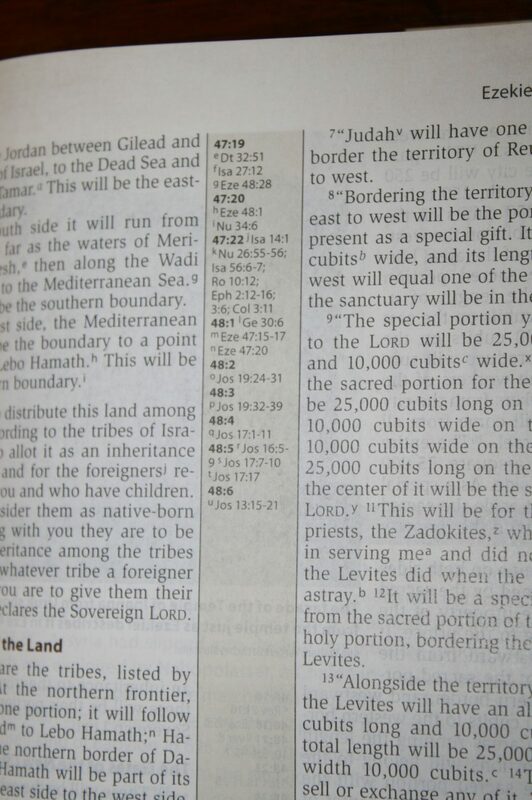 The center column includes the chapter and verse numbers in bold to help make them easier to find. 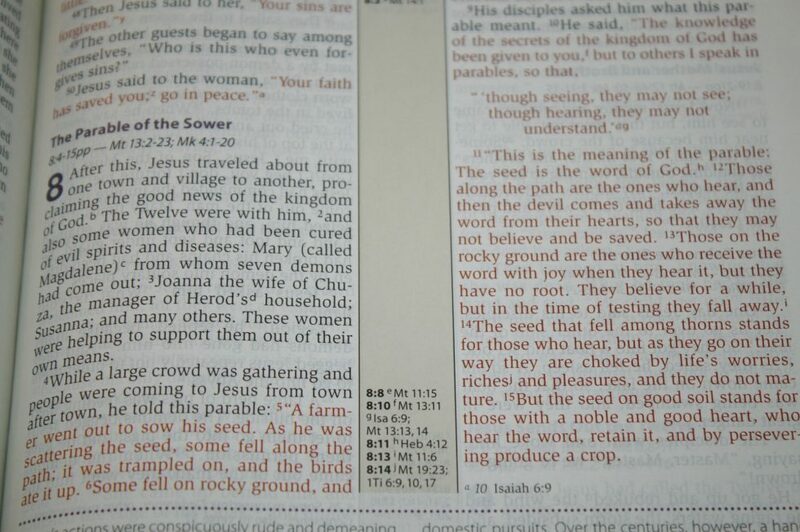 Verses for the left column are place at the top of the center column while verses for the right column are at the bottom. 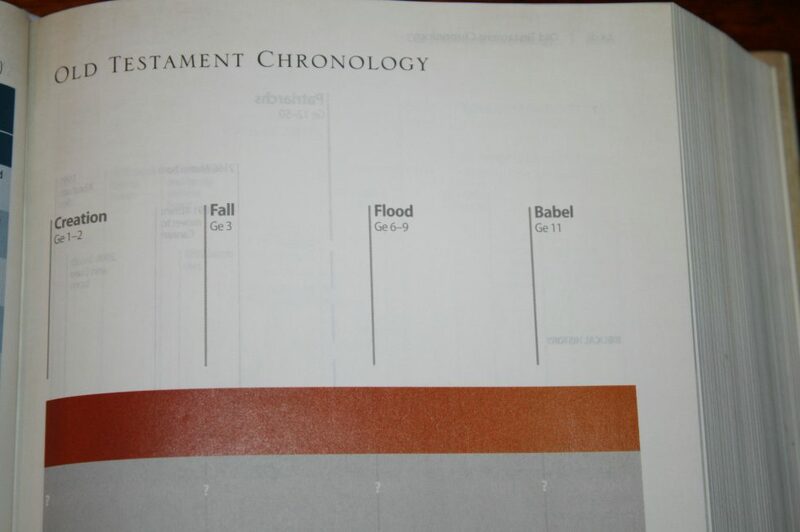 The center column is shaded a dark cream to give the page some visual variation. 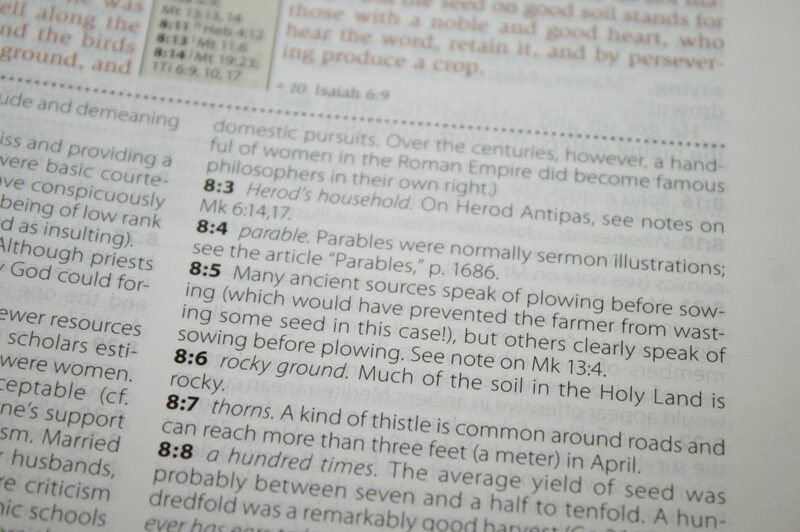 The standard NIV footnotes are placed under the last verse on the page and are keyed to the text with italic letters. 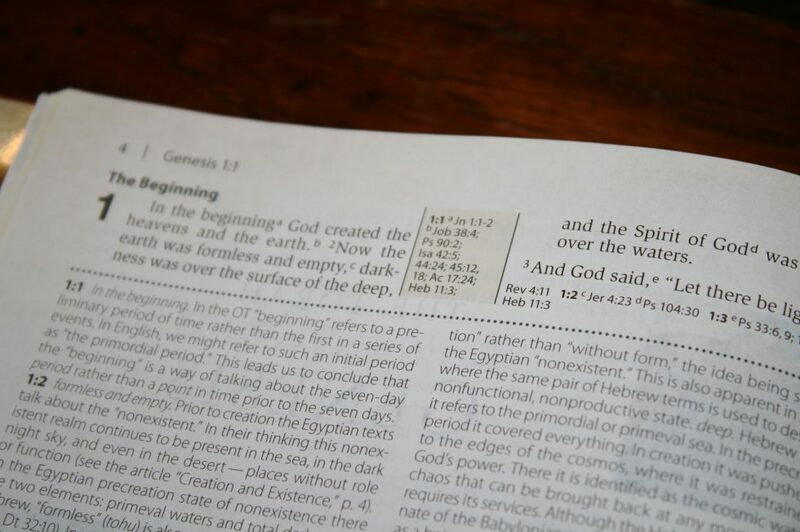 The text contains the letter while the footnote includes the chapter and verse number. 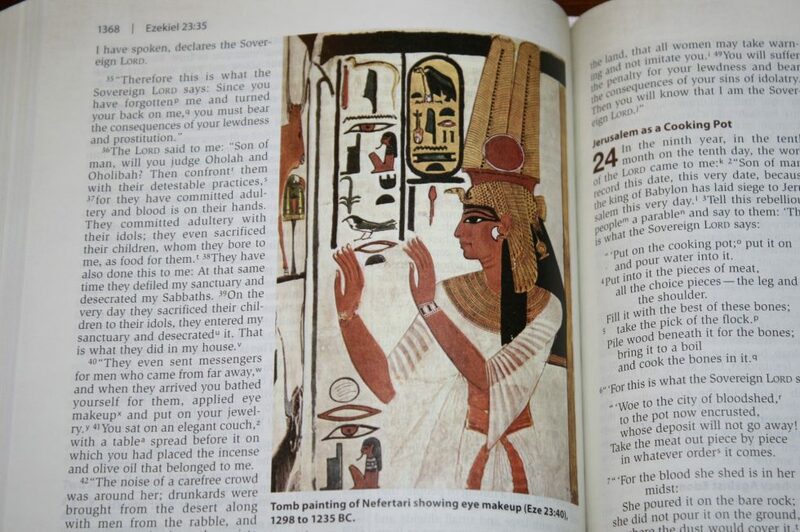 Footnotes give alternate renderings, alternate spelling of names, measures, Greek and Hebrew notes, references showing where something was quoted from, and more. 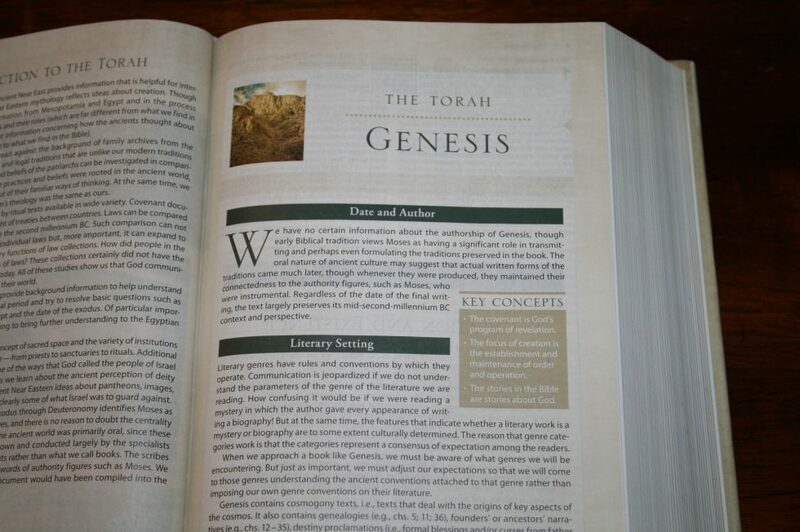 The main point of the study material is to focus on the context. It does this through culture, history, archaeology, and anything else to do with the original setting in the time of writing and the original audience. 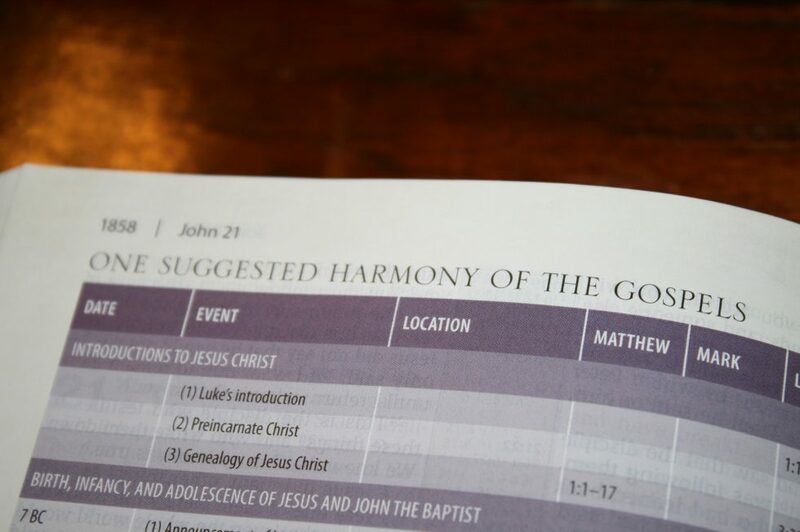 I prefer this to theological bias. Although there is some theology it usually isn’t too deep. 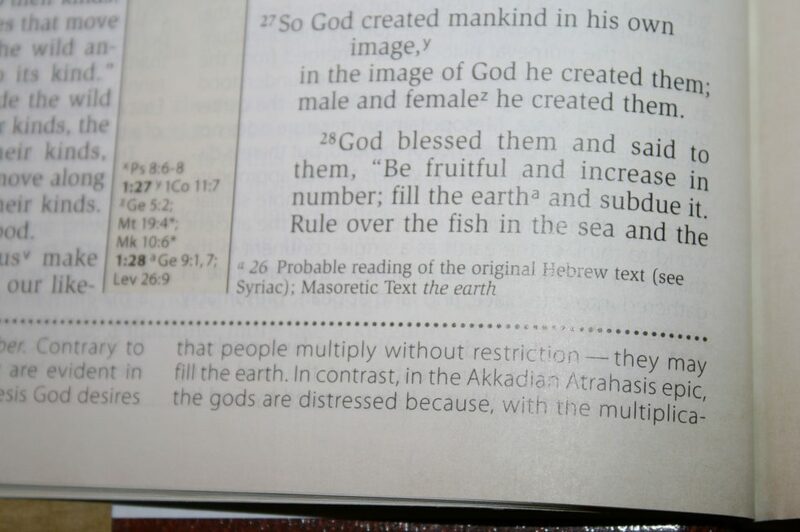 Of course the Scriptures apply to everyone for all time, but it was written to an original audience. There are 10,000 study notes that talk about the culture and setting of the original audience. 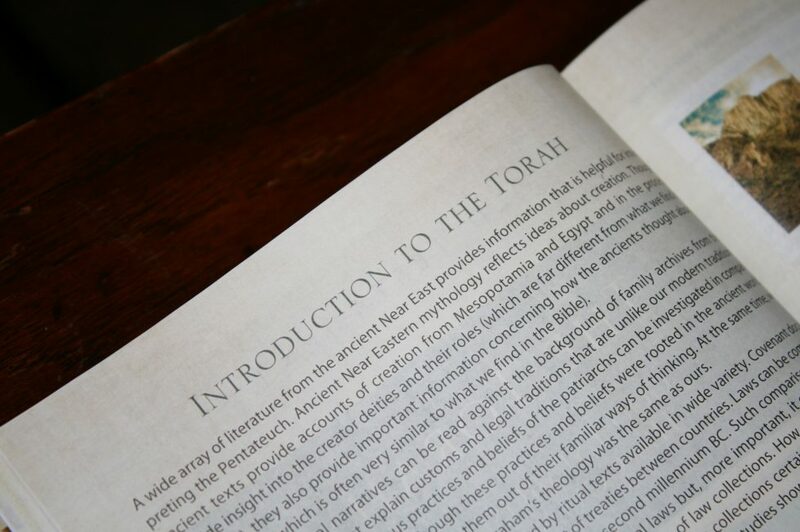 The focus is on the context, politics, land, and the type of literature, and how God’s people were affected and influenced by the culture as well as called to be set apart from it. 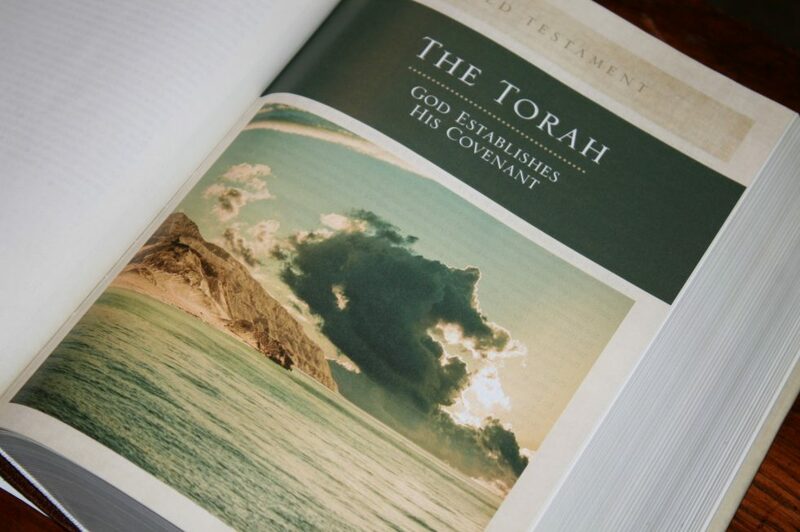 There are lots of full-color photos of places and artifacts that are placed throughout the Scriptures. 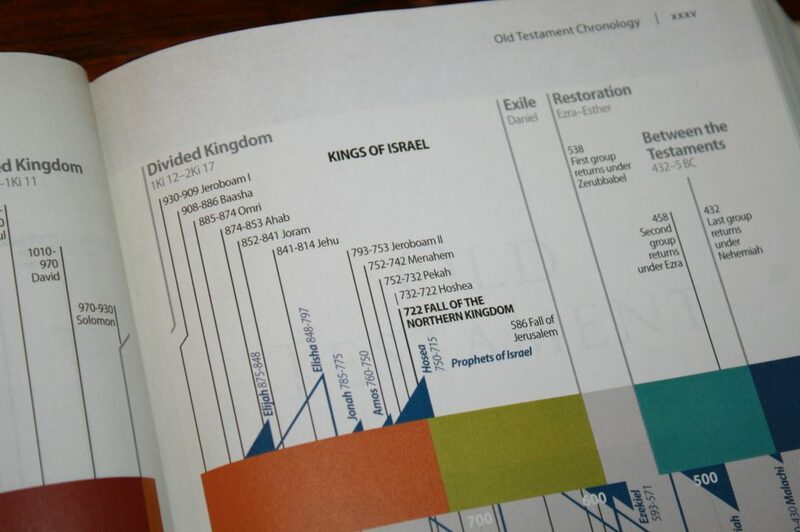 There are also lots of charts throughout the Scriptures that show timelines, covenants, translation philosophies, harmony of the Gospels, qualifications of elders, several about Jesus’ teachings, and lots more. 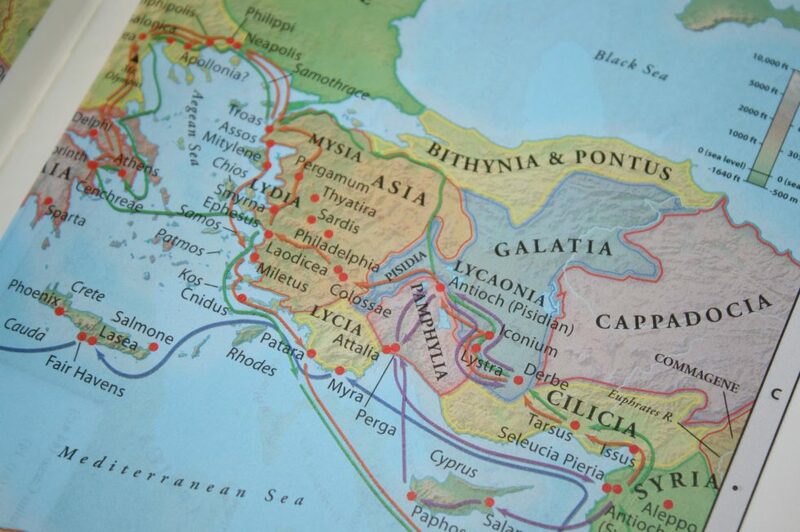 Full-color maps are placed within the notes to show locations and routes. Although theology is discussed, it’s not usually on a deep level and does sometimes discuss multiple views. 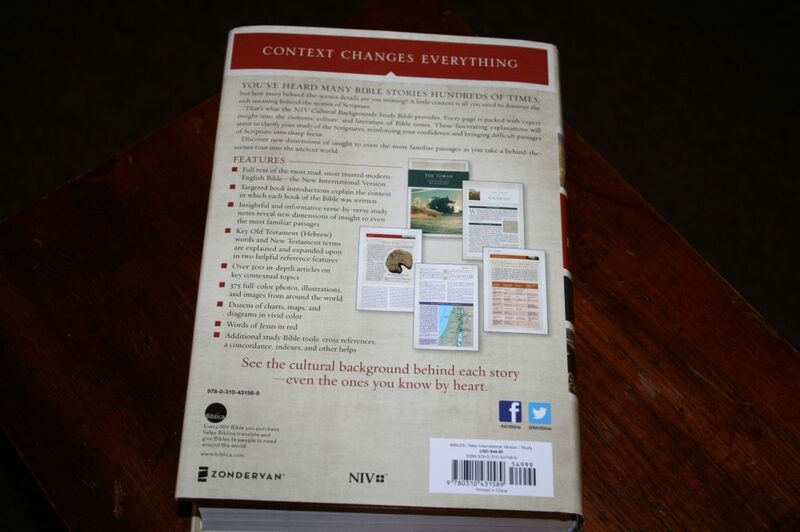 There are over 300 articles throughout the text that cover contextual topics. Many of the articles discuss history, places, artifacts, etc. 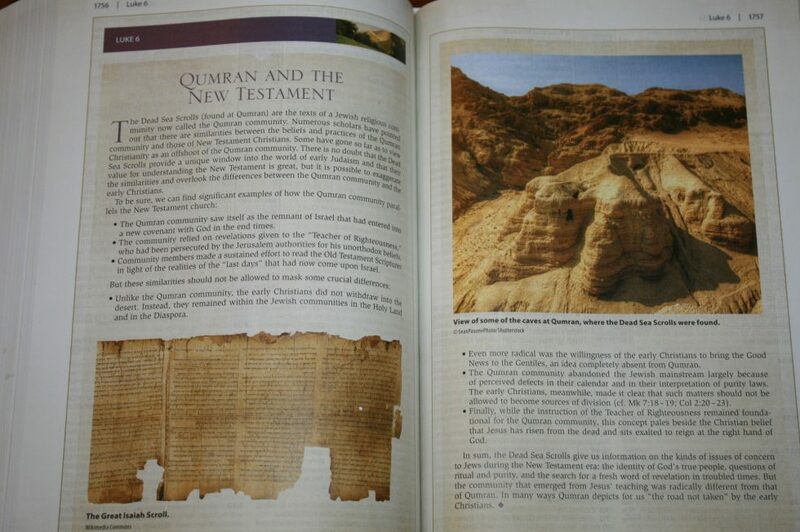 For example, the article titled Qumran and the New Testament shows pictures of the Isaiah Scroll and an aerial view of Qumran and talks about the community there and the importance of the Dead Sea Scrolls. Other articles do include theology but mostly attempt to cover it from a historical perspective. 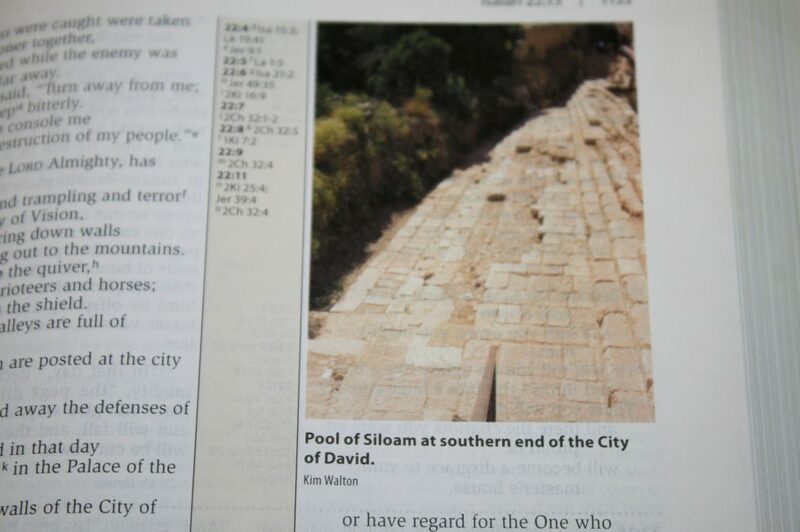 For example, the article on Baptism discusses theological interpretations of water and Spirit baptism. 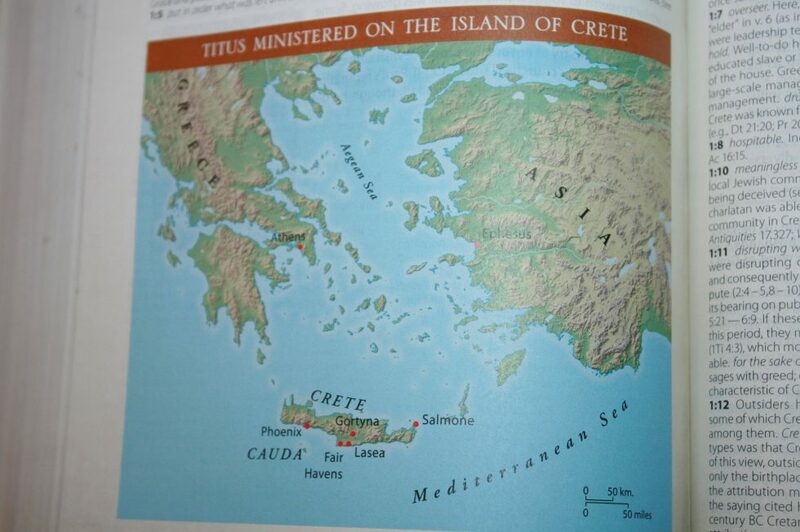 In my opinion this topic was handled better in the Archaeological Study Bible where they discussed that they baptized rather than theological points. Articles in Revelation do often cover multiple points of view. 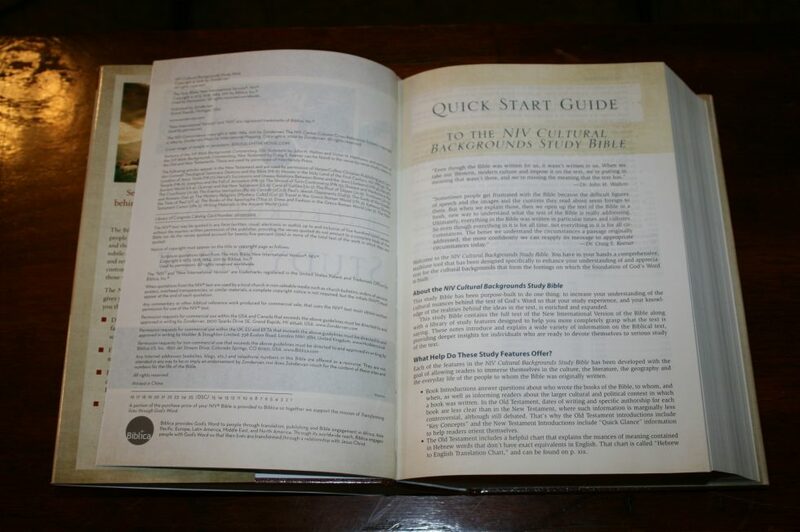 The major sections of the Bible are introduced with a page that discuss the background of the culture, purpose, setting, time-frame, and type of writing. Book introductions take a page and cover the date, author, historical background, literary setting, literary form, structure, and key concepts of the book. The content changes to match the type of book, so it has different types of information for historical books than for poetic or prophetic books. I like this design because they’re not locked into a formula that only works for certain books. The introductions are well-written and informative without making them too large. 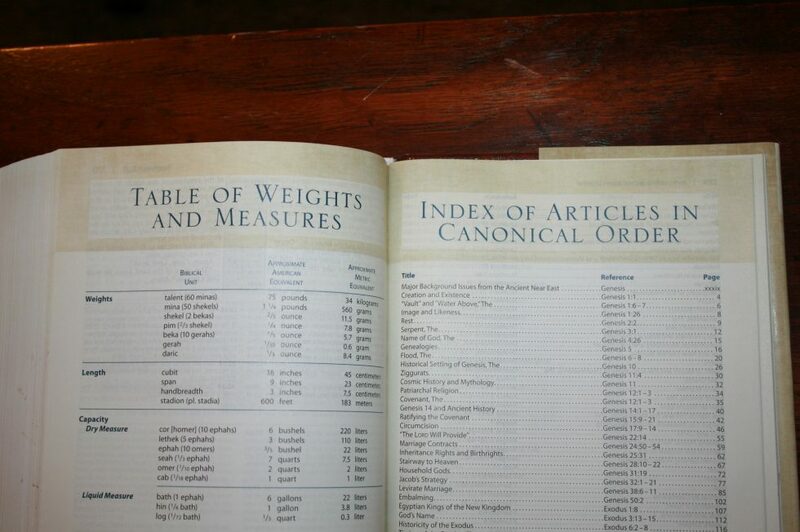 This is a single page that covers weights, lengths, and dry and liquid measures. 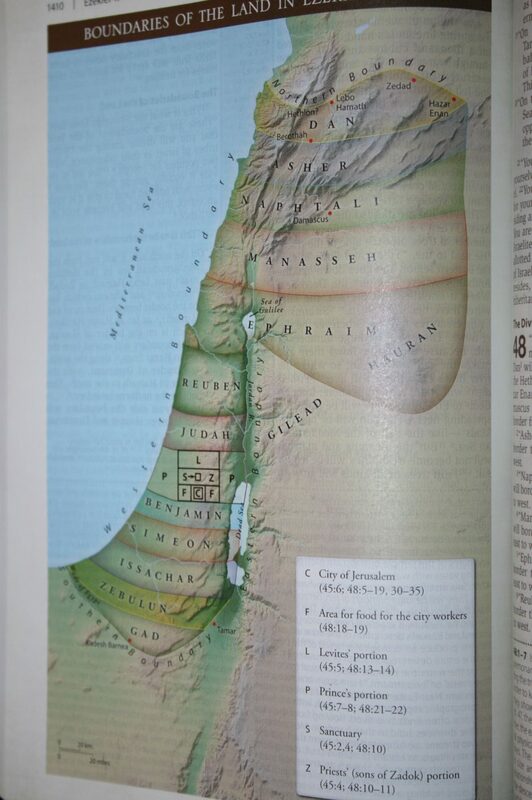 It gives the biblical units with both American and metric equivalents. This is a simple and basic chart. There aren’t any references given so there’s no way to look up examples, but the measures are also given within the footnotes. 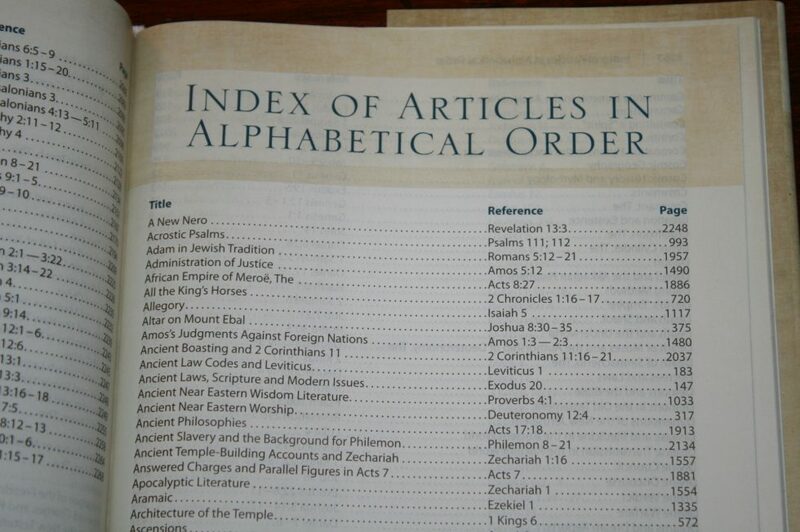 There are two indexes for the articles. One lists them in canonical order while the other lists them in alphabetical order. 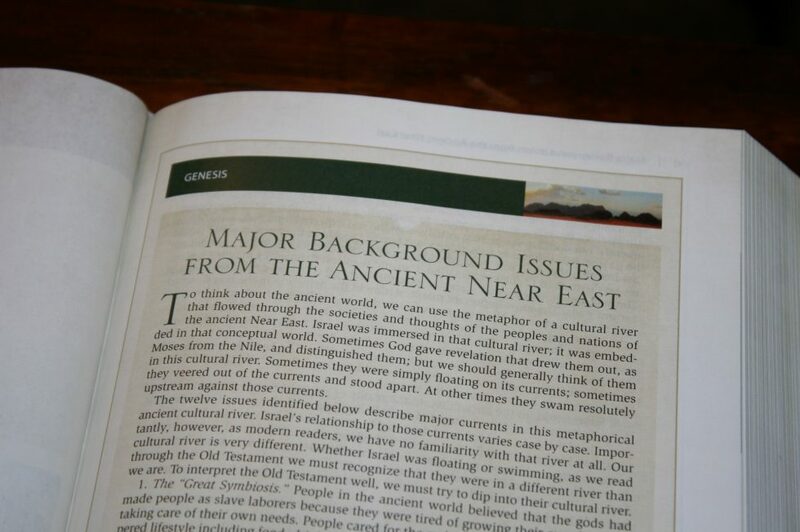 They give the title, reference, and page number making it easy to find articles on any topic or passage. 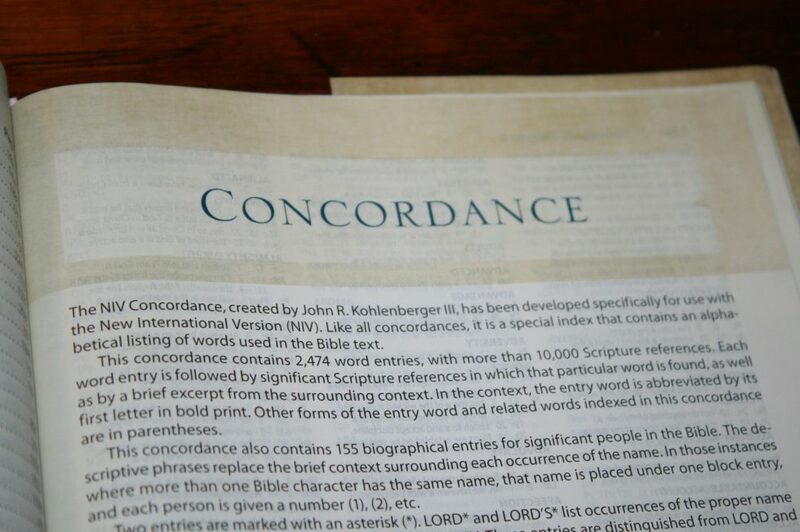 The concordance is 55 pages with 3 columns per page and almost 2500 words. It includes 155 people. Other forms and related words are placed in parenthesis to help you expand your search. It uses several symbols such as an asterisk for the proper name of God, a dagger (which looks like a cross) shows that the word is examined in a chart of Hebrew words and a double dagger indicates the word is examined in a chart of New Testament terms. 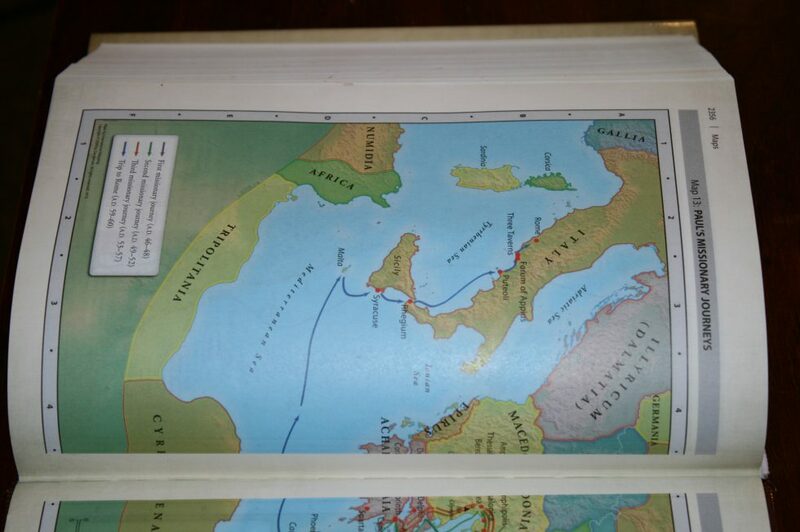 There are 14 full-color maps are printed on regular Bible paper and a 3-page index to maps. 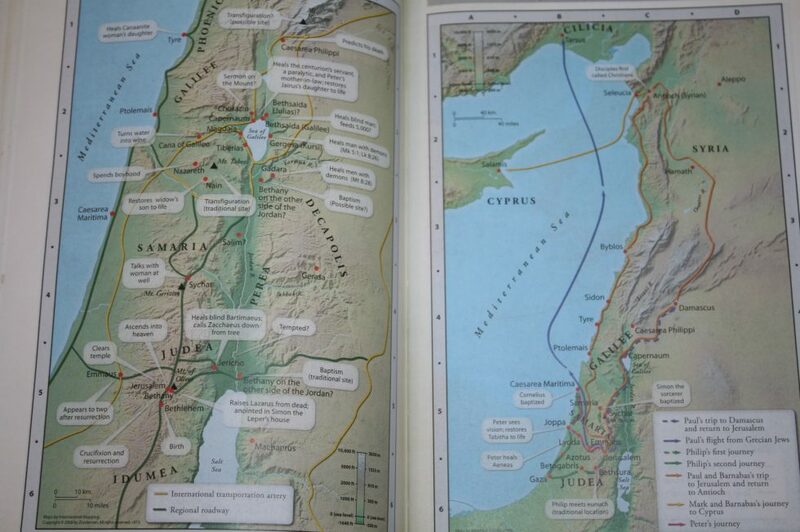 Maps are annotated and include topography, borders, water, cities, distance, roads, dates, and Scripture references. 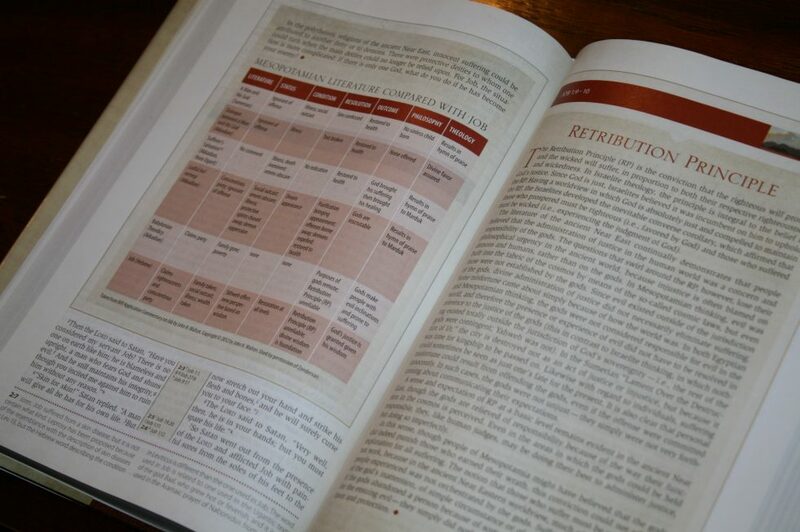 Zondervan’s Archaeological Study Bible replacement, NIV Cultural Backgrounds Study Bible, trims down the bulk, moves back to a double-column setting, and increases the font size. It introduces too much theological bias for my taste, although much of it is light and discusses multiple points of view. I personally prefer to stick with the topic at hand of focusing on the cultures and backgrounds and leaving theology to personal study. It includes enough notes, photos, charts, maps, and articles to make it a highly useful Bible for anyone interested in researching the culture and background of the writers and their original audiences. 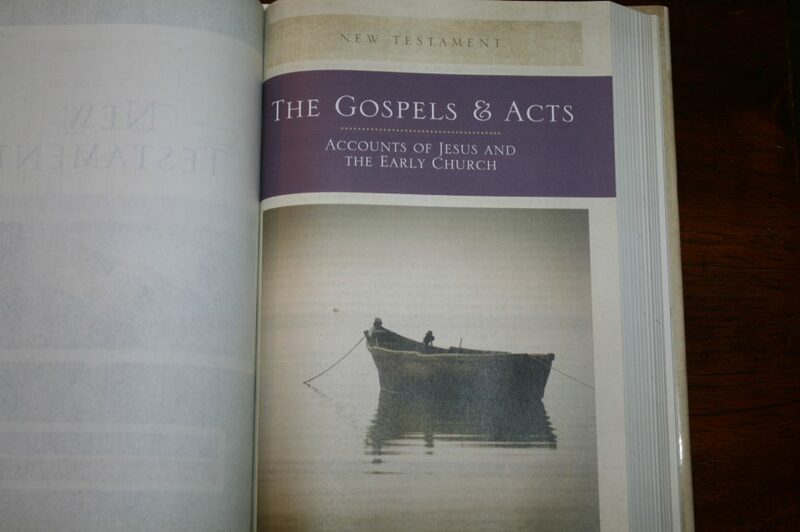 Zondervan provided this Bible free for review. I was not required to give a positive review – only an honest review. My opinions are my own. A really clear and comprehensive review. Hello. It basically sounds as if, other than the change in format and font, that the Archaeological Study Bible and the Cultural Backgrounds Study Bible are basically the same bible? Is that correct? 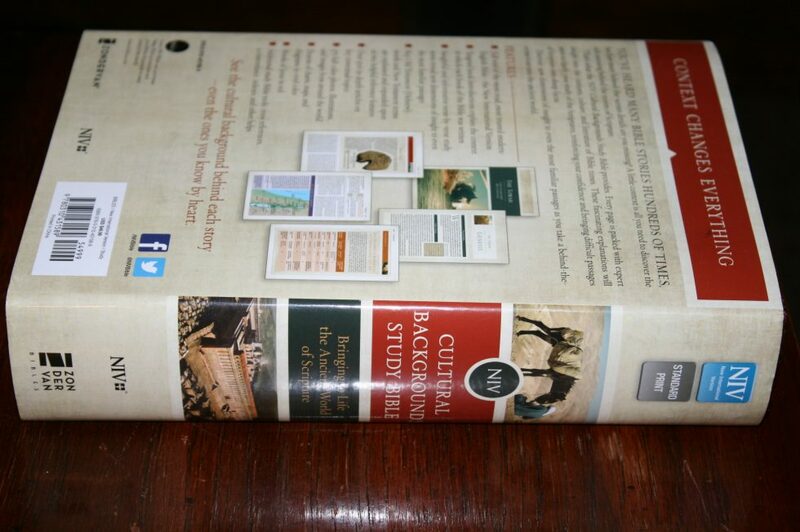 I already own the Archaeological Study Bible and was looking to buy the Cultural Backgrounds Study Bible. I am glad that I ran across your review and would like to clarify. Thanks! Hi K. Sorry for taking so liong to respond. There are a lot of differences in their notes. I need to get them from Church to compare. 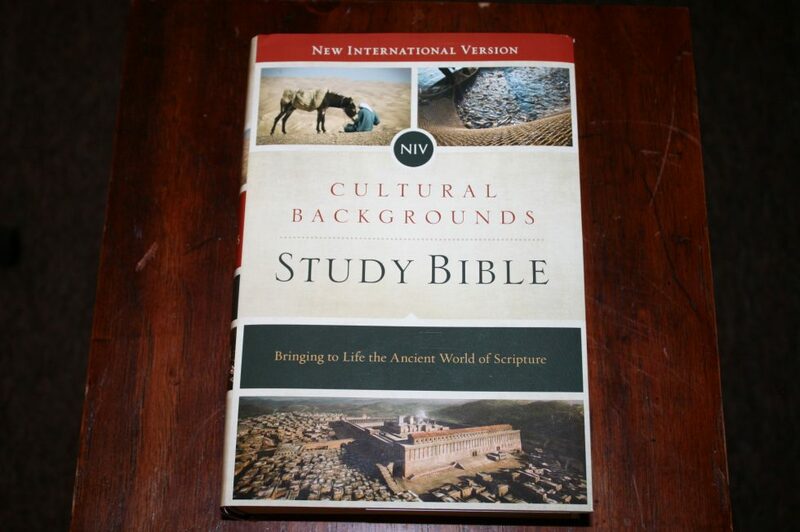 Hi can share the key differences between the Cultural Background Study Bible and NIV Zondervan Study Bible? 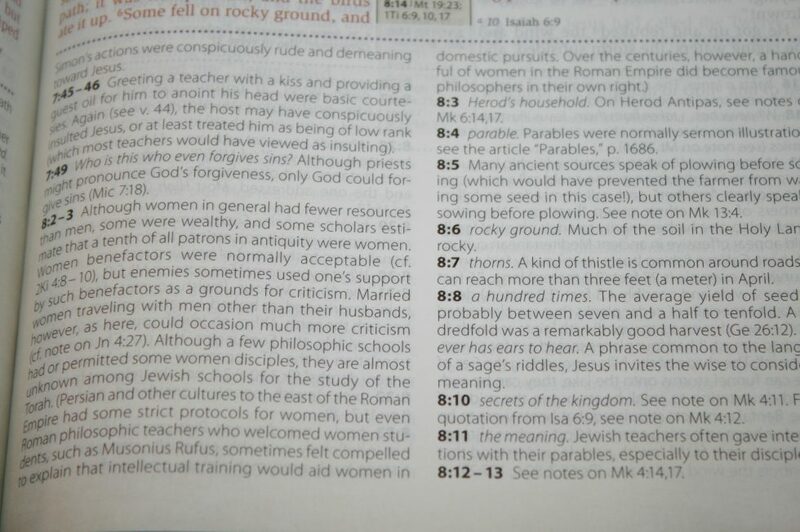 It seems that both study bible talks about scriptures in its original context. 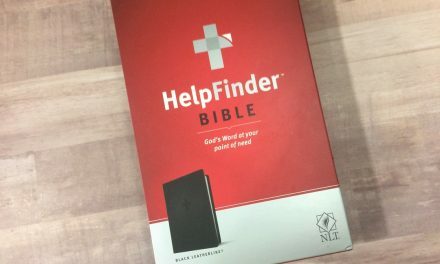 I have currently shortlisted these two bibles and I am sure which one will be the right bible for me as I wanna study the word in its original context. Thanks! Hi Gilbert. I will. Both are currently at the Church. I’ll try to grab them tomorrow. I don’t understand. 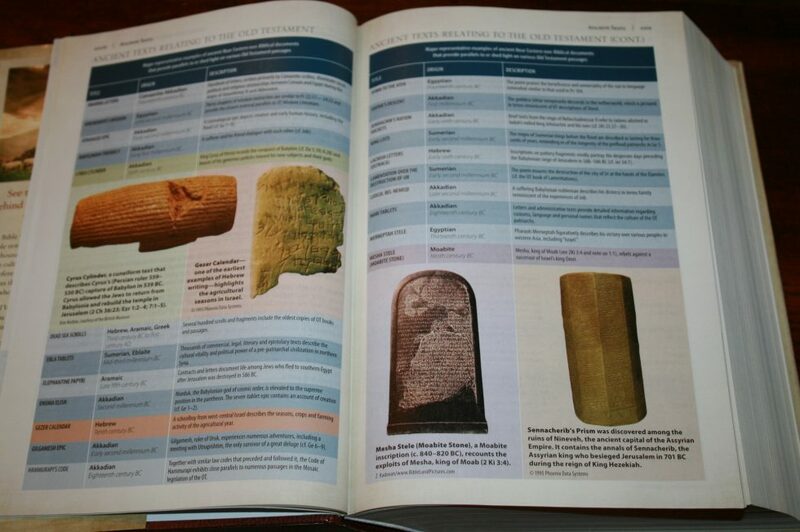 Would it be worth it to own both the Archaeological Study Bible and this Cultural Backgrounds Bible too? Does the previous one cover as much cultural background as this one and does this contain as much archaeological information as the previous one? In other words, is there much overlap between the two editions? Hi Dave. Both cover different information but there is a little bit of overlap. I think it would be valuable to have both. 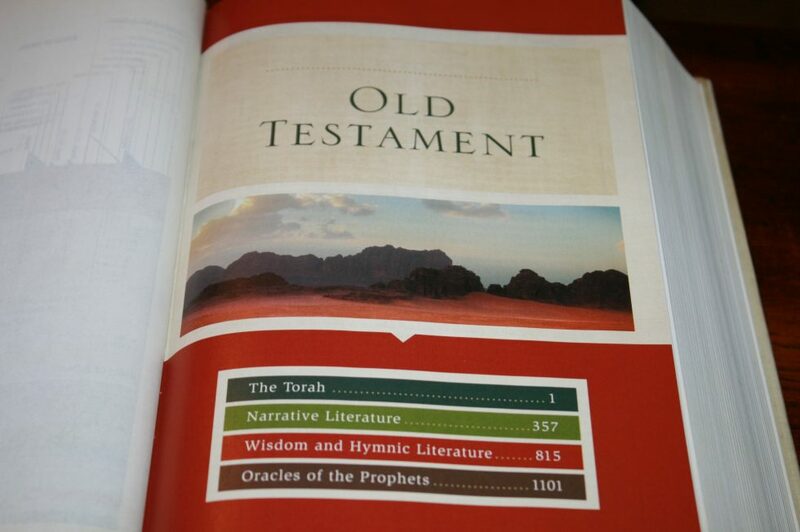 among the three study bible that focuses in archaeology, which one do you prefer most ? 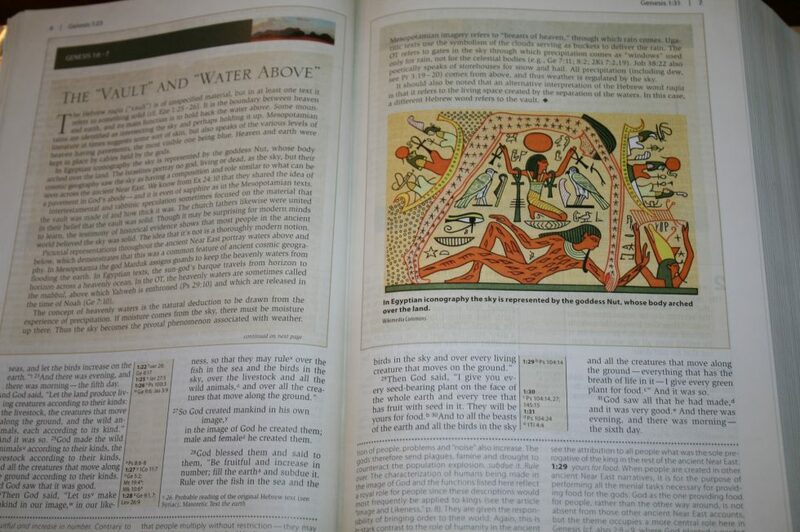 niv cultural background or the niv archaeological or the esv archaeology? most recommended? I actually like them all, but I’d need to go back and compare them if I were to choose just one. I’ll get back to you on this.